Install the connecting rod bearings. Use NEW bearings.Install the bearing inserts into the connecting rod and the connecting rod cap.Lubricate the connecting rod bearings with engine oil.Install the EN-43966 guides-(1) into the connecting rod bolt holes. 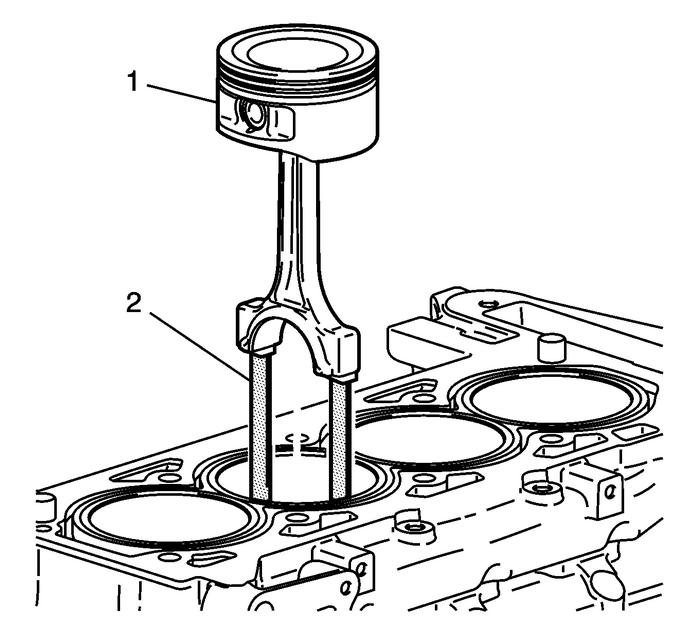 This protects the crankshaft journal duringpiston and connecting rod installation.Install EN-47836 compressor, piston, and the connecting rod to the correct bore.Stagger each piston ring end gap equally around the piston.Lubricate the piston and the piston rings with engine oil.Do not disturb the piston ring end gap location.The piston must be installed so that the mark on the top of the piston faces the frontof the engine.Place the piston in its matching bore.Tap the piston into its bore with a hammer handle. 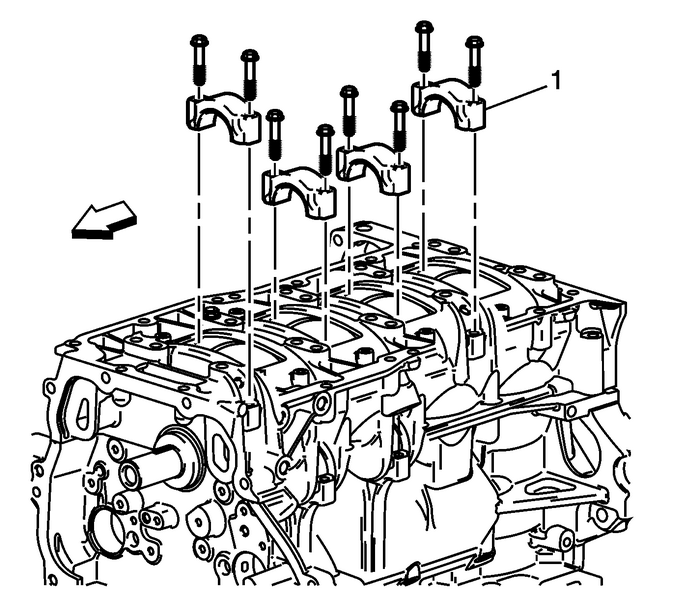 Guide the connecting rod to theconnecting rod journal while tapping the piston into place.Hold the EN-47836 compressoragainst the engine block until all the rings have entered the cylinder bore.Remove the connecting rod guides from the connecting rod bolt holes. 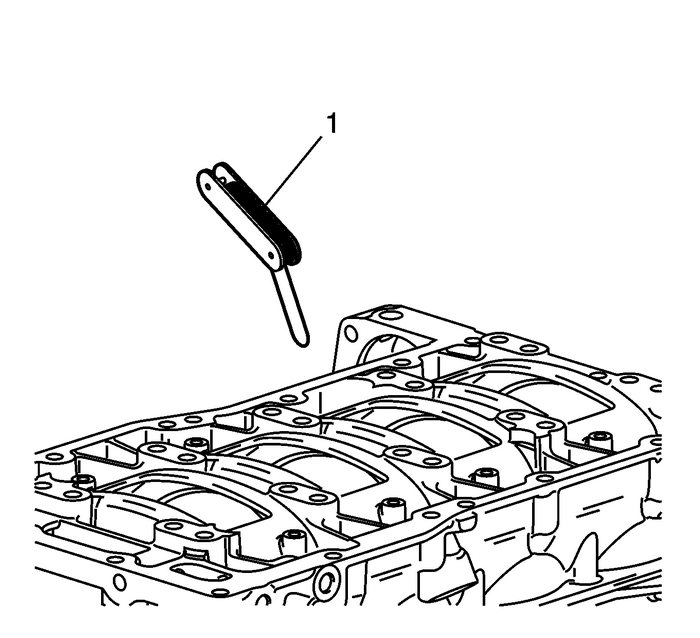 Note:Ensure that the connecting rod cap is properly oriented on the connecting rod. Install the connecting rod cap-(1). Install the connecting rod bolts. Always use new bolts. Tighten the connecting rodbolts to 25-Y (18-lb-ft), plus 100-degrees using the EN 45059 meter.Install the remaining connecting rods and piston assemblies. Measure the connecting rod side clearance with a feeler gauge-(1). The correct clearance is 0.07–0.37-mm (0.0027–0.0145-in).